Canberra wants to conclude deals with three East Asian giants, starting with Korea. It faces some significant hurdles. The current hot topic in foreign and trade policy out of Canberra seems to be the conclusion of long-anticipated free trade agreements with the northeast Asian giants of China, Japan and Korea. 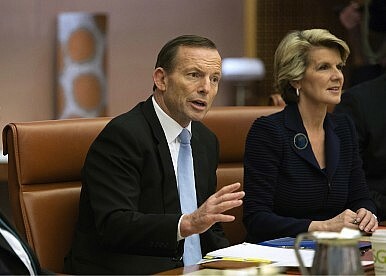 Shortly after her appointment as foreign minister, Julie Bishop confirmed that “[e]xpediting the conclusion of free trade agreements with South Korea, Japan and China is a first order priority of the Abbott Government.” Such enthusiasm has manifested itself in the form of proactive, economic diplomacy, as Bishop completed a whirlwind tour of the region where she met with counterparts in Japan, Hong Kong and Korea. She will head to China in the new year. While the Coalition government's objective of concluding FTAs with Japan, Korea and China within a year is admirable, the ability for the government to conclude negotiations with the three countries – which between them have been in talks with Canberra for more than two decades – is in question. Some observers worry that its tight deadline is too ambitious and risks producing FTAs that only partially fulfill the interests of the signatories. As FTA negotiations between Australia and Korea fast approach their fifth year, attention is now turning to Canberra's ability to conclude a deal with Seoul. Given Korea's recent success in signing FTAs with the U.S., EU and ASEAN heavyweights, a mutually satisfactory agreement with Australia is not beyond the realms of possibility. Korea's enviable collection of active FTAs already covers 60 percent of the global economy, not to mention the agreements still being negotiated that are expected to ultimately cover approximately 90 percent of the country’s trade activity. Both Australia and Korea are enthusiastic about expanding their free trade networks and the benefits of a FTA between the two countries are readily apparent. Korea is currently Australia’s third largest export market and Australia’s fourth largest trading partner. In the last decade, Korean investment in Australia has grown exponentially as Australia increasingly ranks as one of Korea’s top investment destinations. Since 2011, the value of investment proposals by Korean companies in Australia has reached more than $5.3 billion across the mining and resources, renewable energy, infrastructure, commercial property and agribusiness sectors. More and more, Australian companies are also turning to Korea to unlock a range of investment and growth opportunities. In recent years, reputed Australian brands such as Macquarie Bank, ANZ, Rio Tinto, BHP Billiton and Blackmores have all established operations on the peninsula. Australia's strong economic relationship with Korea also translates into political familiarity. As one of the first countries to come to Korea's aid at the outset of the Korean War, Korea and Australia continue to operate as important middle power partners sharing similar values and interests on the world stage. Numerous state visits to Korea by former Australian Prime Minister Julia Gillard, the recent hosting of the Foreign and Defence Ministers' (2+2) Meeting in Seoul, and Minister Bishop’s prioritizing of an early visit to Korea, all testify to successive Australian government visions for an enlarged role for Australia–Korea relations. So why, then, almost five years from the commencement of the first round of negotiations, has a mutually satisfying FTA yet to be formalized? How the US Can Win Its Trade War With ChinaBrunei: Huawei’s Foothold in Southeast AsiaEast Asia Comes to EuropeThe US-China Trade WarA New G2: China and the EU?